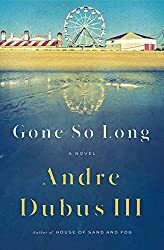 Andre Dubus III’s first novel in a decade is a masterpiece of thrilling tension and heartrending empathy.Few writers can enter their characters so completely or evoke their lives as viscerally as Andre Dubus III. In this deeply compelling new novel, a father, estranged for the worst of reasons, is driven to seek out the daughter he has not seen in decades. Now in her forties, Susan still suffers from the trauma of a night she doesn’t remember, as she struggles to feel settled, to love a man and create something that lasts. Lois, her maternal grandmother who raised her, tries to find peace in her antique shop in a quaint Florida town but cannot escape her own anger, bitterness, and fear. (Starred review) Dubus renders this story of love, jealousy, guilt, and atonement in a voice that rings with authenticity and evokes the texture of working-class lives.… This is a compassionate and wonderful novel. Dubus evokes a dazzling palette of emotions…. Susan, Daniel, and Lois are fully realized and authentic characters… [in] this powerful testament to the human spirit asks what it means to atone for the unforgivable and to empathize with the broken. An ex-convict in his 60s pays a visit to the daughter he hasn't seen since the night he murdered her mother in 1973.… Ahearn is a uniquely sympathetic murderer, and the window we are given into Susan's memories and emotions …brings us very close to her as well. 1. Did you find the number of Susan's flashbacks in the beginning of the novel confusing—perhaps trying to determine whether they were part of her novel or actual flashbacks? If so, did you finally settle in? Why might the author have used the technique—juxtaposing the two kinds of memories (some part of the novel and others in real-time)? 2. Have you ever experienced the types of flashbacks that Susan has, both in terms of the emotional content as well as the serial nature of them (one flashback leading to another)? 3. What do you think of Danny Ahearn? He's a murderer who killed his wife and the mother of his child. Does he deserve our sympathy? Does he deserve his daughter's and mother's-in-law sympathies? 4. It's forty years after Danny murdered Susan's mother. Talk about the lasting impact that trauma has had on Susan's life, both as a child and as an adult. 5. Follow-up to Question 4: Talk similarly about Lois, Susan's maternal grandmother and the mother of Linda. How has she dealt with her daughter's death over the years? 6. One of the primary questions this novel asks is whether redemption and forgiveness (is there a difference?) can ever come out of an act as horrific as Danny's? 7. Talk about the ending? What, if anything, is resolved? What is your opinion of how the novel ends?